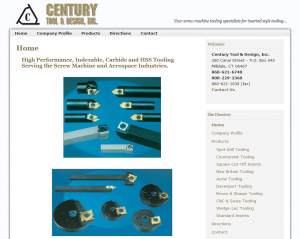 Ready for their 2012 catalog to be published, Century Tool and Design of Plantsville, CT, needed a website that would be basic in style, but would allow potential and existing customers a place to view their full catalog online. With world-wide customers, this online portal is an essential piece of their business. We used a customized version of our “Basic-Clean” template here, with accents to match their catalog color scheme. The highlight of this site, however, is the PDF viewer on each catalog page. This allows the Century staff to replace individual pages throughout the year when products change through an easy-to-use online interface. We also set up a complete Google Apps account for their entire staff for business email, saving them from multiple headaches previously experienced with Outlook Express. Visit www.centtool.com and give it a test drive. We welcome your comments!